Hi! Well I think we kicked off SUMMER just right! We took the kids to Glass Beach in Fort Bragg for the first time. It was so fun exploring the beach. Not as much glass as we thought but it was still very cool! We looked around for quite a while. Collected some treasures and took some fun pics. Once we were done taking pics we did return the glass to the beach. ;) If everyone took glass, there would be none for future generations to see. We did keep our shells though. 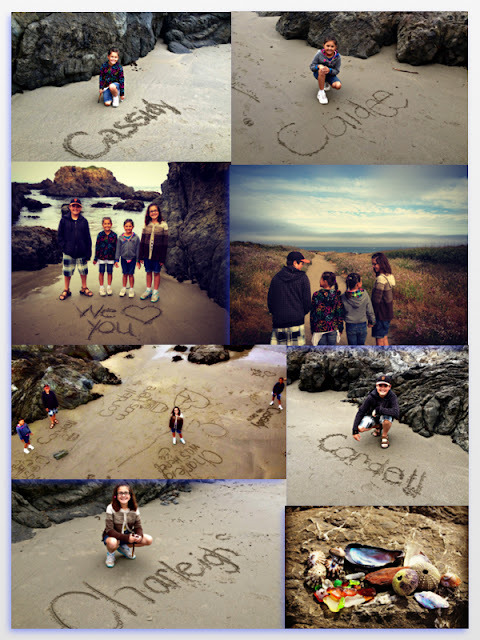 Here is a collage of our day at GLASS BEACH. I love that we got pics of the kids with their names in the sand. I think that was the best part for me. I can't wait to print them out! If you ever get a chance to visit Fort Bragg, Glass Beach is a must stop. Your family will love it! There are a lot of rocks to climb on, pools of water up on the rocks, living creatures to watch (crabs, fish, birds), many sizes of glass to see and very cold water to feel. LOL It was like stepping into a big glass of ice water. HaHa! We also took the kids home through THE GIANT REDWOODS. We took them about 3 years ago, but wanted to go again. And I am sure we will be back again. The trees are just so amazing. The drive isn't the greatest home though. Many of us get car sick and the ride is a little curvy. Well a lot curvy. Eeekkkk. We survived by chewing a lot of peppermint gum. haha. 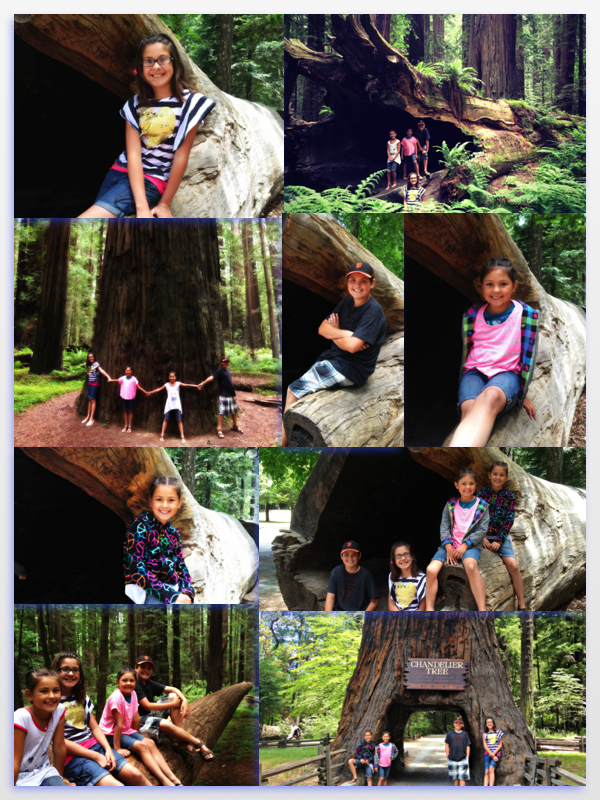 Here is a collage of our GIANT REDWOODS pics. The Drive thru tree was very cool. Our car couldn't quite fit, or lets just say we didn't want to risk it. HeeHee! There are many trails that we will explore more in the future, but we did see some pretty cool ones this time. One fallen tree was fun to explore and climb on. We saw a few other fallen trees and even some hollowed out ones. There was a lot of poison oak, so we had to be careful on the trail and luckily none of us touched it. And if we did, I guess we aren't allergic, but will always be careful in the future. LOL One specific trail we want to try is a 6 mile trail through the Redwoods. Thats on the bucket list. ;) Maybe next year. That was our first weekend of fun to kick off the Summer. We plan on camping some and taking more drives. I think some waterfall hikes are our next stop on the list! We love hiking and exploring. Can you tell? What an amazing place to live near. Fun photos!